Copyright © 2013 Xue Li et al. This is an open access article distributed under the Creative Commons Attribution License, which permits unrestricted use, distribution, and reproduction in any medium, provided the original work is properly cited. A rotating liquid film reactor (RLFR) is a device of two coaxial rotating conical cylinders with the inner cone rotating and the outer one stationary. A complete mathematical model for the flow between the conical cylinders is built and a dimensional analysis is carried out. 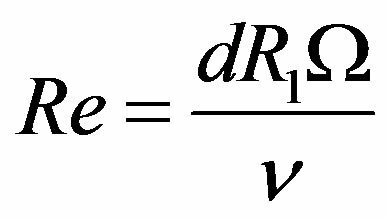 It is proved that at each point of the flow field the dimensionless pressure and velocity of the flow are determined by parameters: Reynolds number (Re), aspect ratio (Γ), radius ratio (η) and wall inclination angle (α). Furthermore, a sufficient and a necessary condition are derived from mechanical similarity between RLFR and a manufacturing equipment geometrically similar to RLFR. Finally, a numerical simulation for the distribution of pressure and velocity is performed. The results may provide a theoretical basis for experiment method and numerical simulation of the flow in a RLFR-like device. The viscous flow between concentric rotating cylinders, called Taylor-Couette flow (TCF) , has been studied by numerous research workers for over 300 years (see  and the references therein). This is a classical system to investigate properties of flow driven by rotation. So far, an abundance of experimental and numerical results on TCF are available. Recently, another configuration related to rotating body has aroused the interest of researchers. A few chemists have constructed a precipitation reactor, called rotating liquid film reactor, which is used as a reactor to prepare new functional nano-particles. It is found that, compared with conventional precipitation reactors, the particles produced in the RLFR are smaller in size and narrower in size distribution . The RLFR consists of two coaxial conical cylinders with the inner cone rotating and the outer one stationary, as displayed in Figure 1. The walls of cones are parallel giving a constant width of the gap for RLFR. The gap between two cones is filled with reactants, which are usually considered as a viscous incompressible fluid. In order to figure out the effect of the RLFR on precipitation, it is necessary to investigate the properties of the flow in the gap. This can be done by experiment and numerical simulation. However, the properties of the fluid flow depend on many parameters, e.g. 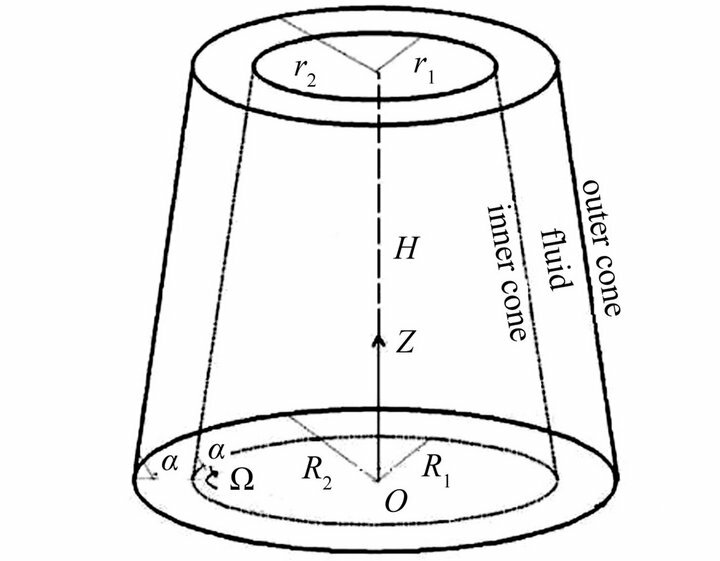 (rotor’s angular velocity), (viscosity), H (cone’s height), (inclination angle of the cone), (bottom radius of the inner cone), ( bottom radius of the outer cone). In order to reduce the dimension of the problem, it is necessary to conduct a dimensional analysis. The dimensional analysis is also a basis for experiment and numerical simulation. Moreover, the RLFR is very tiny, compared with the manufacturing equipment. The reactor has a height of 17 mm, upper diameter of 40.8 mm, bottom diameter of 50 mm and inclination angle of 75 deg. The gap width can be adjusted in the range of 0.1 mm - 0.5 mm by moving the stator (outer cone). The rotor (inner cone) can rotate at variable speeds up to 5000 rpm by a adjustable-speed motor. One may ask that, to what extent, the flow properties obtained by experiment and numerical simulation for the RLFR could reflect that of the real flow in manufacturing equipment. This is a problem of mechanical similarity. Trying to reduce the dimension and to derive mechanical similarity of this problem are the motivations of our paper. As far as we know, there is no paper dealing with this problem. Figure 1. The sketch of the coaxially rotating liquid film reactor. with the inner one rotating and the outer one at rest have been experimentally studied by Wimmer [4,5] and numerically by Noui-Mehidi et al. [6,7], Xu et al. [8,9] and Li et al. . In [4,5] Wimmer studied the stability of basic flow and the transition to Taylor vortices, as well as the occurrence of Taylor vortex at different geometries. Noui-Mehidi et al. [6,7] investigated the effect of wall alignment on the flow and the stability of the helical flow, as well as the transition to turbulence. Xu et al. studied the dependence of the velocity and the pressure magnitude on the cone inclination. In  Xu et al. showed that the behavior of the flow is dominated by a competition between the meridional flow and the radial flow. Li et al. discussed the local maximum value of velocity and the local maximum of pressure, as well as the transition to Taylor vortices. The paper is organized as follows: Mathematical formulation is given to Section 2. Section 3 and 4 are devoted to dimensional analysis and mechanical similarity analysis, respectively. A numerical simulation for the pressure and the velocity is implemented in Section 5. Finally, the conclusions and some discussion are made in Section 6.
where and denote velocity, density, pressure and kinematic viscosity of the fluid, respectively. denote the top end plate, the bottom end plate, inner and outer cone side, respectively. is the angular velocity of the cones. We set Cartesian coordinate system as in Figure 1. Removing “*” we have . Theorem 1 Let be the solution of the initial and boundary value problem (11)-(17), then at any time point and each point of the flow field, are determined by the dimensionless parameters: Reynolds number (Re), aspect ratio , radius ratio and cone inclination angle . We all know that the size of RLFR in laboratory is very tiny, compared with that of the manufacturing equipment (i.e., the actual object), which is geometrically similar to RLFR. Therefore, one obvious question is weather the data obtained by experiment and numerical simulation for the flow in RLFR can characterize the properties of real flow in the actual object. That is the question we like to answer in this section. We now consider the necessary condition for mechanical similarity of two flows. Assuming that there are two flows with dimensionless velocity and dimensionless pressure , as well as corresponding dimensionless parameters: and , where stands for the first flow and the second one. We suppose that the two flows have mechanical similarity, i.e. where, and satisfy the dimensionless Equations (11)-(14) with the boundary condition (16)-(17). In order to ensure that two solutions are equal, the solving region should be the same one, which leads to . The nonlinear and the time dependent Equation (1) together with the boundary conditions (3)-(4) and initial conditions are integrated numerically using the finite volumes method. 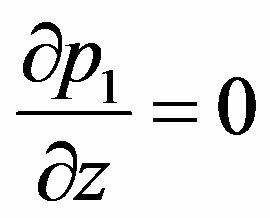 For the convection terms in equations, a second-order upwind scheme is used to interpolate the face values of the various quantities from the cell center values. Central difference quotient is used for the diffusion terms which are always secondorder accurate. The temporal discretization involves integrating all the terms in the differential equations with a time step . The integration of the transient terms is implicit by using a second-order formulation. The SIMPLE algorithm is used to link pressure and velocity. The discretized equations are then solved sequentially using a segregated solver. For the justification of the numerical method, one may refer to . From Sections 3 and 4, we know that the distribution of the pressure and the velocity of the flow depend on and . In this section, we have chosen and as examples to calculate the distribution of pressure and velocity as well as the streamline of the flows. Figure 3. 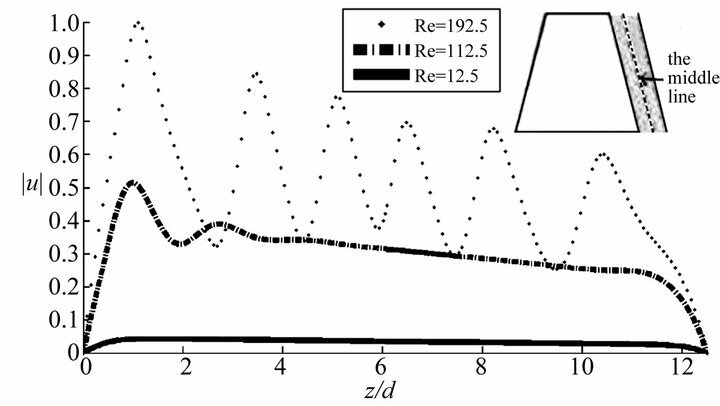 Front view of streamlines of the flow for and , (a) at Re = 12.5 Taylor vortex is not formed; (b) at Re = 112.5 the first Taylor vortex appears; (c) at Re = 192.5 the annulus is filled with six-pairs of vortices. bution curve of the pressure and the velocity near the bottom end plate (see: Figure 2 and Figure 3(b)). From Figure 3(c) we see that the gap is filled with six-pairs of vortices at about , in this case the whole distribution curves of the pressure and the velocity are fluctuant. 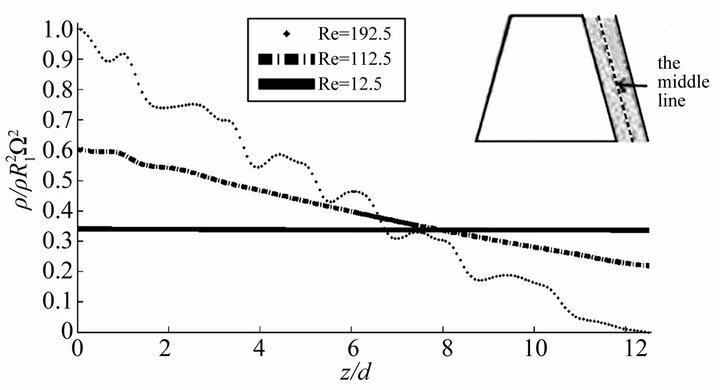 In this work dimensional and mechanical similarity analysis for the flow in rotating liquid film reactor (RLFR) are presented. It is proved that at each point of the flow field the dimensionless quantity of pressure and velocity is completely determined by parameters: and . Moreover, between RLFR and a manufacturing equipment geometrically similar to RLFR, a necessary condition and a sufficient condition for mechanical similarity are derived. Finally, as examples, numerical simulation for some parameters is implemented. The distribution of pressure for in Figure 2(a) looks like a horizontal straight line, the actual calculation result is not the case. The reason is that the pressure amplitude for is much larger than the one for and the pressure in this figure is nondimensionalized by the largest pressure. 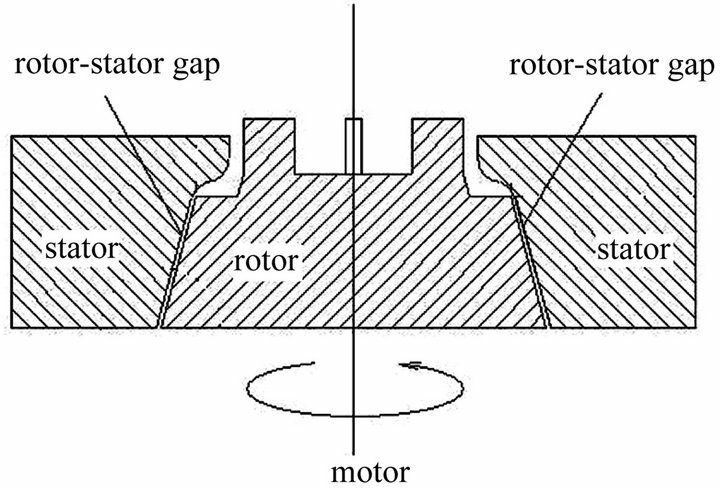 In  it is showed that increasing the speed of the rotor in the RLFR or increasing the rotor-stator gap resulted in a decrease in particle size and narrower particle size distribution. The experiment in  also suggested that the turbulence had big effect on particle size and particle size distribution. The turbulent effects were directly related to and . There was no discussion on the effects of parameters and . The results in this paper imply that the particle size and the particle size distribution depend not only on and (included in ) but also on parameters and . How the particle size and particle size distribution depend on and is an interesting problem which is worth studying both experimentally and numerically. Moreover, our analysis reveals that and are not independent, they may substitute each other, at least from qualitative point of view. This assertion requires experimental verification. The results obtained in this paper provide a theoretical basis for further study of the reactor by experiment and numerical simulation.